In a new segment called "Conversations we a Couponer", we at Saverr would like to take the time to talk to some of todays master couponers. In our first segment, we were lucky enough to speak with Dian from GroceryShopForFREE.com. Dian started couponing after her son came home from a friend's house where he was astounded by the amount of goods the family had stored. "My 16 year old son came home and was so excited that at his friend's house he could eat all the cereal and frozen pizza he wanted! He told me I had to talk to his friend's Mom and find out how. So, I called her and she met with our church group and taught us how to use coupons effectively." But isn't it hard to become a couponer? Dian explains that she learned by just doing. "It gets very easy once you understand each of your local store's policies. There is no way I could ever stop. I could never go back to paying full price when I know I can get it for much less." A few more questions that we asked Dian are listed below. I like the coupons I find in the Sunday paper the most because I can get multiple copies and stock-up when there's a good sale. How much money do you save per year? I save right around 75% or more. What are some good strategies to save the most money? Are some stores better than other when it comes to using coupons? In my area the stores that double and triple coupons are obviously better than the ones that don't. But, overall with price matching and a great coupon policy Walmart seems to beat everyone out now. Look for the best deals, and often those are online. Try to get FREE shipping when you can, make sure that when you purchase online the shipping charge doesn't "kill the deal". Always check store websites, coupon databases, phone apps, and newspapers for any sales or discounts before making your purchase. Is there anything else you think that people should know about using coupons? Keep in mind that coupons are like money that the stores and manufacturers give you to purchase their products. Treat them like money. I would like to thank Dian for taking the time to speak with us. 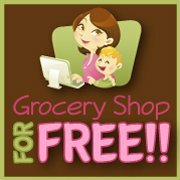 If you would like to learn more about Dian and GroceryShopForFree.com, make sure to check out her Facebook Page, Twitter, Google+, Instagram, and Pinterest. Click the button below to download Saverr!